Sean (Robert Sheehan) and Derek (Carlito Olivero) work as valets at a restaurant who burglarize the homes of rich customers after gaining access to their car keys. One of those customers, Cale (David Tennant), happens to be a serial killer. Upon his arrival at Cale's house, Sean stumbles on a woman, Katie (Kerry Condon) held hostage while tied to a chair. He snaps her photo, leaves Cale's house, and does everything he can to alert the police and FBI about Cale's crimes. That task, though, becomes easier said than done when they refuse to believe his allegations. 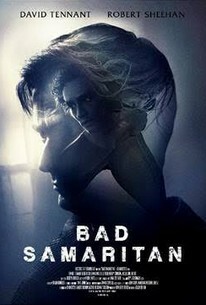 The less you know about Bad Samaritan's plot before watching it, the more you can enjoy its many twists and turns. The screenplay by Brandon Boyce eschews plausibility for the most part, but it's very suspenseful without a rarely a dull moment to be found. A crime thriller is only good as its villain, so in this case, Cale makes for a very memorable psychopath much like Norman Bates in Psycho. David Tennant's performance, which goes over-the-top at times, never veers into campy territory, although it does come very close. Tennant is captivating to watch and seems to be having a lot of fun in his role. He rises well above the mediocre, lazy and increasingly preposterous screenplay that has as many holes in its plot as there are in Swiss cheese. Director Dean Devlin moves the film's pacing along briskly enough without any scenes that drag, and there are a handful of scenes with Hitchcockian suspense and atmosphere, such as when Sean hides in his car to spy on Cale. It's interesting to note that Tennant resembles Anthony Perkins throughout the film---Bad Samaritan might as well have been called Psycho IV which would've been very fitting. It's nowhere near as smart, moving or well-shot as Hitchcock's Psycho nor as provocative as Arlington Road or William Wyler's The Collector, but it's still a wildly entertaining guilty pleasure that's far more entertaining than the overrated borefest known as Avengers: Infinity War. As long as you don't mind checking your brain at the door, Bad Samaritan is a gripping, exhilarating and shocking crime thriller. Number of times I checked my watch: 1 Released by Electric Entertainiment.Opens nationwide. Number of times I checked my watch: 3 Released by Focus Features.Opens nationwide.